As we all know that Apple has just released their brand new iPhone 7 and iPhone 7 Plus. With their release we came to know that, there is no more 3.5mm audio jack in Apple iPhone 7 and iPhone 7 Plus. Either you need to use Lightening Jack to 3.5mm Audio Jack Converter to use your existing earphones with your brand new iPhone 7 or iPhone 7 Plus or Lightening Earphones for iPhone 7 and iPhone 7 Plus which are included in the box of iPhone 7. Else you have the option to buy Apple Wireless AirPods which will cost you $159. Apple AirPods use W1 Wireless Chip by Apple to connect with your iPhone. These AirPods don’t use Bluetooth technology. 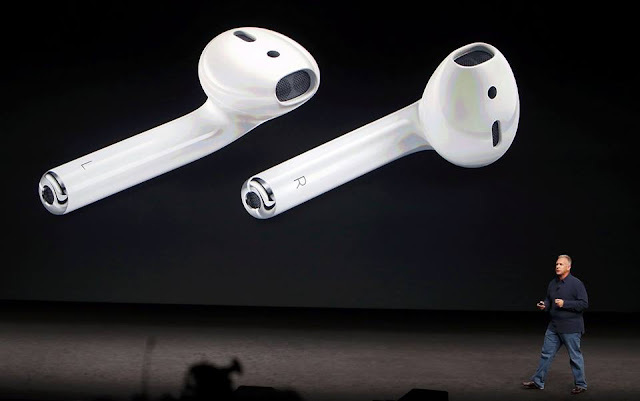 The shape of AirPods is somewhat awkward and many people have criticised the Apple’s decision to remove 3.5mm audio jack. The AirPods are costly and you need to buy them separately, they are not included with Apple iPhone 7 and iPhone 7 Plus. Though the sound quality of Apple AirPods is quite good. We at iPhone 7 Fan Club, had also covered Best Bluetooth Sports iPhone 7 and iPhone 7 Earphones. You will also be interested to learn the Price of Apple iPhone 7 and iPhone 7 Plus in USA.